Another ham post? Yes. Yes it is. And there will be more after this one. I can't help it that I love it so much! I currently have three in my freezer. (I may have forgotten that I had two in there when I bought two more, but I just can't pass up sales that have them for $.70/lb!) You can just do so much with leftovers that I will bake up a ham whenever the craving strikes because, well, I guess I consider it a pantry staple. This is one of my latest leftover ham creations. It was inspired by a pineapple and ham pizza that I made a few nights before. 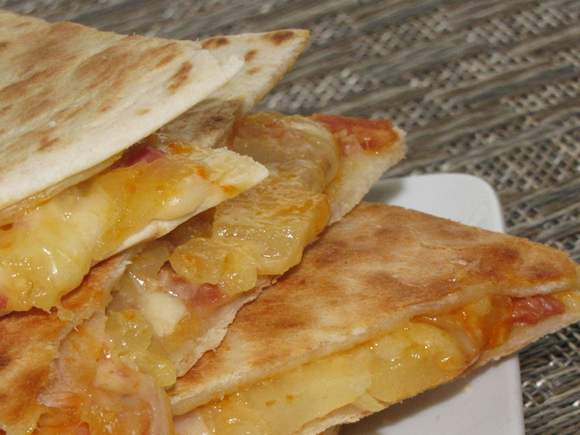 I have to say that this quesadilla made me forget all about that pizza though. This is my new go-to for a quick leftover ham lunch. So quick to prepare and so yummy! I used some leftover Roasted Red Pepper Sauce from a previous dinner but you could just as easily chop up some red pepper or throw in a couple roasted red pepper slices instead of the sauce. It did, however, add a nice creaminess so if you have the ingredients, give the sauce a shot - it's super easy to make. There isn't much in terms of an actual recipe for this one since everything can be set to your own specific preferences. I've added approximate quantities of what I used below though. 1. Spread one tortilla with half of the sauce. 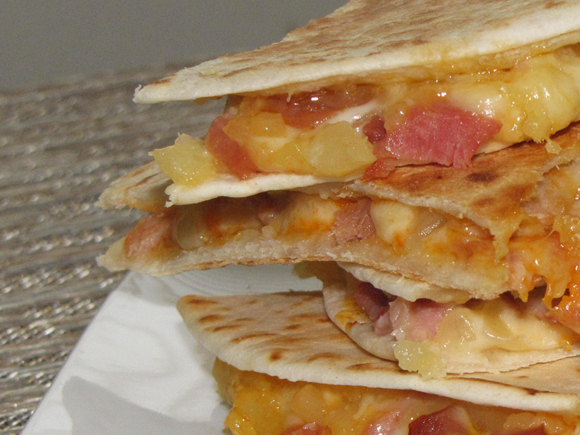 Layer ham, pineapple and cheese on top of sauce. 2. Spread another tortilla with the remaining sauce and place on top of the ham so the sauce is on the inside. 3. Cook in a dry skillet over medium heat until cheese is melted and tortilla is lightly browned.